The famous "there's an app for that" saying has never been truer than when applied to learning and playing guitar. You don't even need a guitar to play guitar music. There are a number of different virtual guitars available, including one in Garage Band. You can even jam with a buddy remotely using Garage Band's Jam Session. And if you don't know how to play? The iPad can teach you. Musicians have long been on a quest to make learning music easier. Most of us are familiar with traditional music sheets, but to a novice, those scribblings might as well be in another language. Many musicians use lead sheets, which transcribe the chords with letters (C, D, Fm, etc.) and include the melody using the traditional notation. Guitarists have gone to an even simpler method: tablature. Tablature is similar to traditional music notation, but instead of putting those quarter note, half note, and whole note symbols, tablature records a number corresponding to the fret the note is played with the line designating the string. This allows guitarists to "read" music without actually knowing how to read music. But before you can jump into tablature, you will need to know the basics. Have you ever wanted guitar instruction to be as simple as playing Guitar Hero? Playing an actual guitar will always be tougher than playing a plastic one. After all, there are six strings and up to twenty-four frets on a guitar, which means you essentially have around 150 "buttons" for your fingers. That's a bit more than the five you will find on a plastic guitar. But learning guitar doesn't need to be that different than learning a song on Guitar Hero. A few companies have used games like Guitar Hero as an inspiration. Rocksmith is a popular app on the PC that does this, but where Rocksmith fails is trying to be too similar to Guitar Hero or Rock Band. Let's face it, neither of those games was ever intended to teach us to play an instrument, and while the interface works great as a music game, it's not a great way to teach guitar. Yousician gets it right by using a similar scheme as those music games but having the music flow from the right side of the screen to the left side. This creates a moving version of the "tablature" for the song or lesson. Tablature is the music notation guitarists often use. It's a simplified version of musical notation, but instead of a sheet of quarter notes and half notes and whole notes, the lines on the page represent strings and the numbers represent frets. In this way, tablature can tell you exactly what to play even if you don't read music. And because Yousician uses a tablature-like interface, it teaches you to read tablature as you learn the guitar. Yousician starts with the very, very basics of playing a single string and slowly works through chords, rhythm, and melody. It plays similar to a game, with challenges to keep you going in the right direction. And if you aren't quite a beginner, you can do an initial skills test to jump to the appropriate level. The app itself is free and you will get a free lesson or challenge each day. If you want to speed up the learning, you can pay for additional lessons, but if you want to take it slow, you can learn the guitar without spending a dime. There are a ton of apps available for learning guitar basics, songs, and styles, but very few of them are worth the time or money. This isn't to say they are poorly done. CoachGuitar is an example of a very well made app with a lot of great video content to help you learn songs and different styles of playing guitar. But at $3.99 a song lesson, it can also get very expensive very fast. A better way to learn songs is to use what is freely available on the web. You can find the tablature to almost any song by searching the web. Just enter the song name followed by "tab" and you'll find dozens of links to most songs. But there's an even better way to learn a song—YouTube. It is a lot easier to learn a song by having someone walk you through it and show you where to place your hand and your fingers. 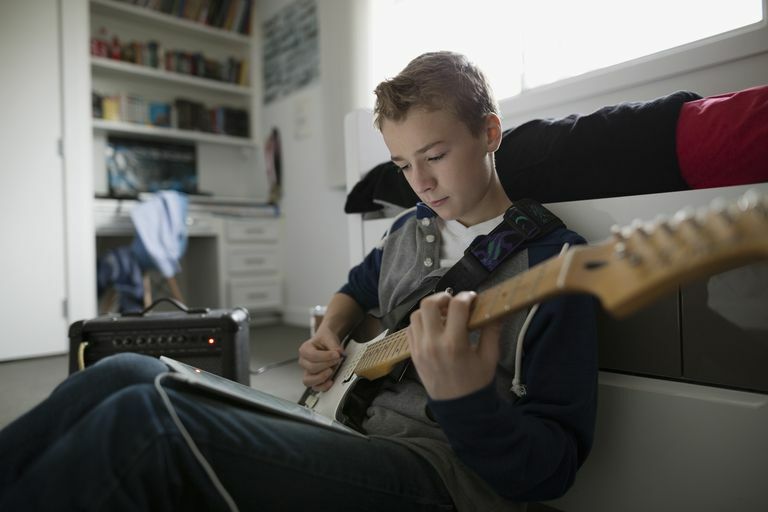 Similar to searching for tablature, simply search for the song name followed by "how to guitar" and you'll find a number of lessons to choose from for most songs. The YouTube video is great for getting the basics of a song and learning the tricks to how to make playing it easier. Once you have the basics, you can use the tablature as a reminder until you memorize the song. Learning the basics of how to pick and how to strum chords and learning specific songs are a great way to begin, but if you want to advance as a musician, you will want to learn some theory. This doesn't need to be anything complicated like how to play through the different modes of the major scale. It can be as simple as learning the blues scale so that you can improvise over the standard 12-bar blues. Again, this is where YouTube is your best friend. If you are interested in learning blues, type in "how to play blues on the guitar" and you'll find a treasure chest full of lessons available for free. You can do the same with jazz, country, folk, or almost any form of music. The iPad isn't just a great way to learn how to play guitar. You can also plug your guitar into it and use it as a multi-effects unit. IK Multimedia makes the iRig HD, which is basically an adapter that allows you to plug your guitar into your iPad through the Lightning connector at the bottom of the iPad. You can use iRig to get the most out of Garage Band's amp simulation and multiple effects. But Garage Band is just the tip of the iceberg. IK Multimedia has a nice range of apps in their AmpliTube line that will turn your iPad into a virtual pedalboard. Or, you could go the opposite way. Line 6 produces the Amplifi FX100 and the Firehawk HD. These multi-effects units use the iPad as an interface for stage-ready effects. You can use the iPad to pick out a tone for the unit by typing in the name of a guitar player or song and looking up sounds available on the web. This lets you get a tone similar to the one used on the album.